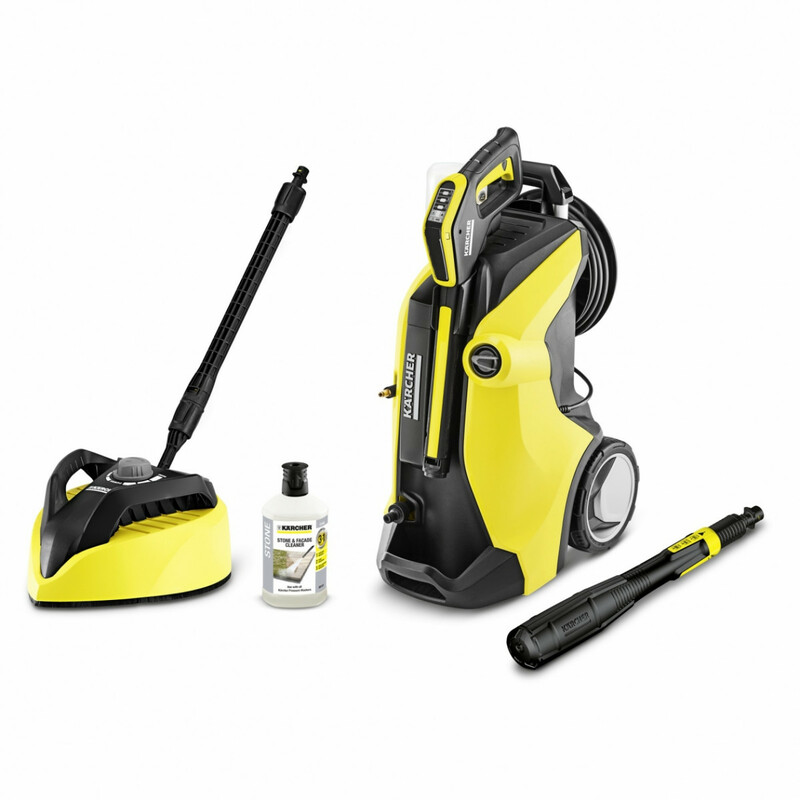 The K7 Premium Full Control Plus Home is our most powerful pressure washer, with our latest cleaning innovation – a single multijet lance that can be adjusted for all your cleaning needs. The Kärcher K7 Premium Full Control Plus Home is our most powerful pressure washer, with all the outdoor cleaning power you need. It includes our latest cleaning innovation – a 3-in-1 Multijet lance that can be adjusted between vario lance, dirt blaster and detergent application settings. The pressure for each setting or the detergent dosage is easy to regulate with the simple buttons and LED display on our touch control trigger gun, and the hose is stored on a handy reel, with on-board storage for all other tools. The Plug and Clean detergent system makes applying detergent mess-free and easy. This model also includes a Home Kit, with a T450 Patio Cleaner for hard surfaces like decks and patios, and a 1L bottle of Stone and Facade detergent. There’s also an 10m high pressure hose to give you plenty of reach, and a state-of-the-art long-life water-cooled motor that gives extra durability and outstanding performance, backed by the Kärcher 5 year warranty. With buttons for pressure regulation and detergent dosing, as well as LCD display. Includes Quick Connect. The detergent can be replaced quickly and conveniently in just one simple motion. Space-saving storage of the trigger gun and the spray lance in the device. This meand the trigger gun is ready to use at all times.